So I started writing this post almost a month ago, which was way late, then my computer locked up and I lost 3/4ths of it. Besides being extremely unhappy that I had lost my blog post I was also freaked out that my computer was acting so strangely. Well the holidays hit in full force and rewriting my blog was way don't on my to-do list. So, here we go again with a down and dirty version. I had to get at least one more in before the end of the year. As you may have seen in an early post I was hosting a basket workshop with JoAnn Kelly Catsos at my house in November. 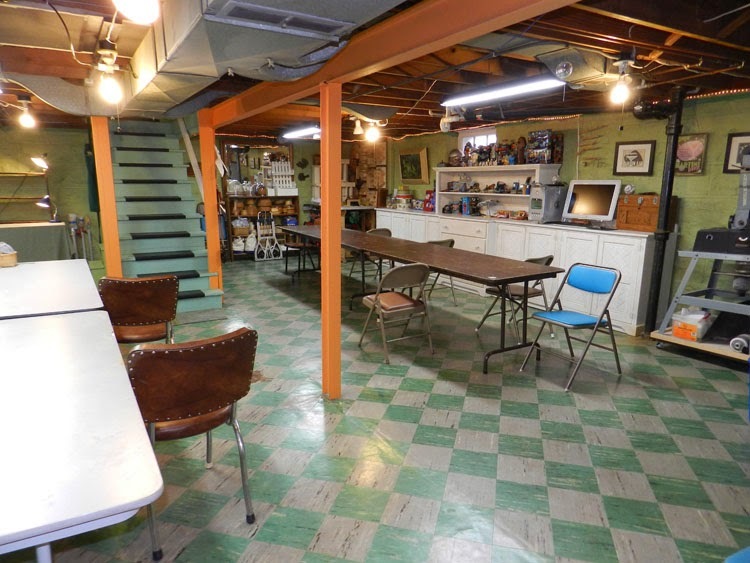 Well as you can see from the photo above the basement was a bit of a mess. Since Eric Taylor's class in the spring I had been busy with a myriad of projects (most of which were only half finished). 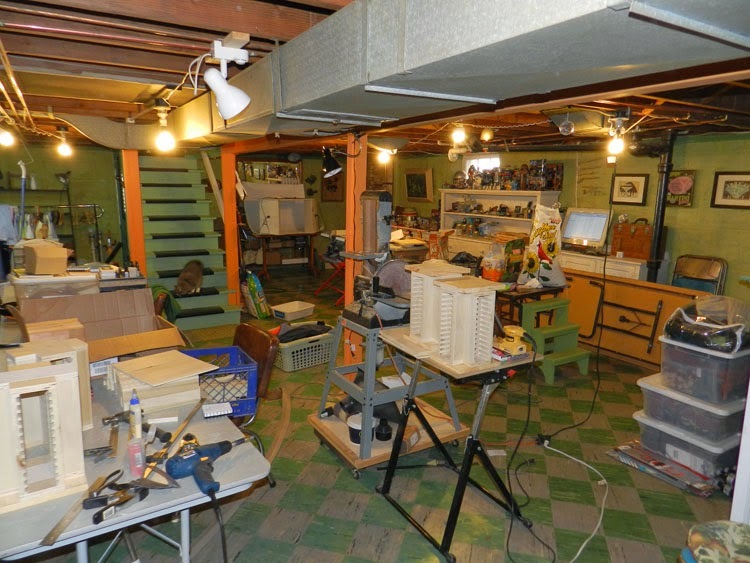 I have pretty much drug every tool and project out and filled every available work space with stuff. Unfortunately this setup was not going to be conducive to hosting a class. Well I kicked it into high gear the week before class and had everything ready to go by the time JoAnn arrived. Quite the transformation wouldn't you say? Unfortunately I won't show you what it looks like a short month later. I don't know where this mess comes from. I am convinced it is gremlins. JoAnn's workshop was fabulous as always. For three days we worked on a lidded sewing basket and then on the forth day, either additional little cheese boats to go inside the sewing basket or a miniature. Since I had made the lidded sewing basket in the very first class I ever took with JoAnn I wanted to do something a tab bit different. So, instead of doing the quadrafoil pattern on the lid like everyone else I decided to do the JoAnn's snowflake or octafoil pattern. This meant that instead of having four petals to my clover-leaf pattern, I was going to have eight! This also meant that I was going to have way, way, way more uprights in both the lid and the bottom. If that wasn't bad enough I had to go one step farther and weave a crazy twill pattern while laying up the base of each. The basket was very fun to make, but definitely a challenge. Typically when I am doing the class baskets I have lots of time to get up and take photos of the other basketmakers. Well, not this year. 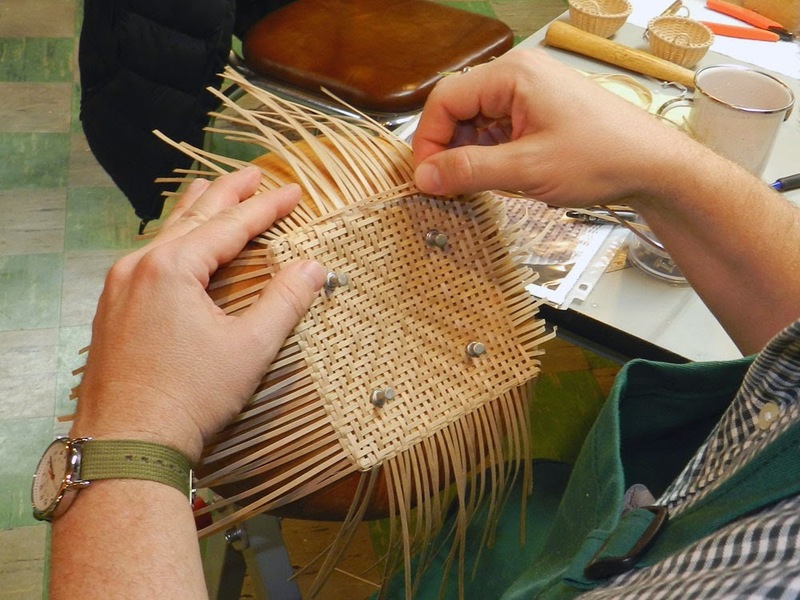 My fanny was firmly planted in my seat and I was concentrating on weaving. I did take a few photos and one of these days I will get them up on my website, JASkets.com. Fortunately some in the class snapped the picture above of me working on the bottom to by basket. Now I just need to get my photo background and lights set back up so I can take some photos of the finished basket. Oh well, that will have to wait until after the first of the year. Which reminds me, here's to an incredible (and productive) 2015!